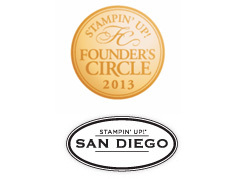 Alright, we’ve reached the last day of my 10 days of Celebration of my 10 years of being a Stampin’ Up demonstrator! I have been sharing projects and ideas over the last few days and hopefully you’ve found some fun ideas to try. Now, since this post was supposed to go live yesterday (whoops!) I’m extending the deadline to enter all the giveaways until 9pm pst tonight. So, make sure you have followed the links near the end of this post to enter all of the prior days by leaving comments on the blog and then leave a comment for todays as well. I was blown away by the card I’m sharing with you today. It was created by my friend Breelin Renwick – who is an amazing stamper – for a swap. It is such a good example about how little touches of gold can really make a huge impact on the finished look of your card! This card mixes and matches the gold foil in the doily, punched out leaves using gold foil paper, and the gold mini sequins. 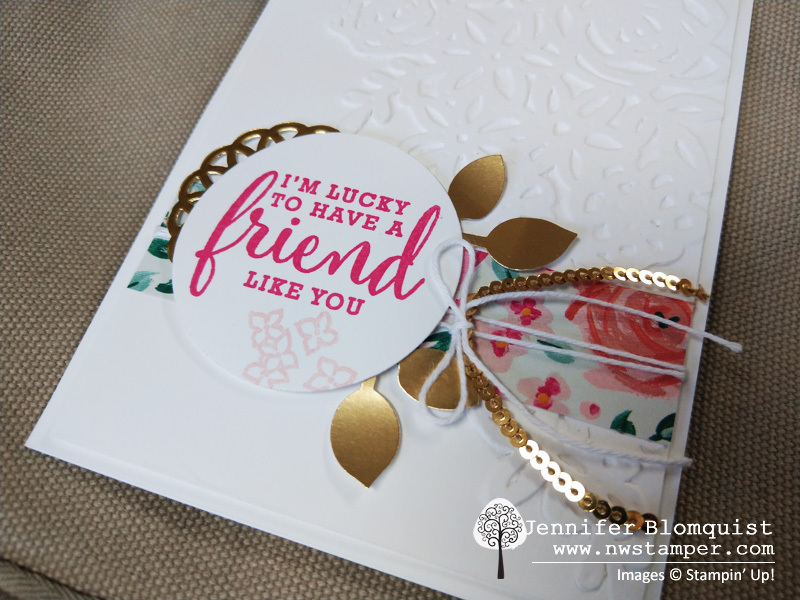 The sentiment and stamped flowers is from the Love What You Do stamp set and it goes so perfectly with the rest of the items from the Garden Impressions suite. I will admit, the watercolor impressionistic flowers and designs from this suite doesn’t call to me when I see it all together like in the pictures in the catalog; but changing out the stamp set and using the designer paper and the dies as a pop of texture and color really works for me! It makes for a stunning, soft background that lets your shinier elements really stand out, don’t you think? 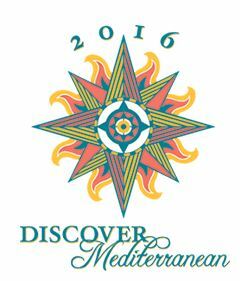 But the hidden amazing touch is the *embossing* using a thinlit die! Can you see it in the picture above? 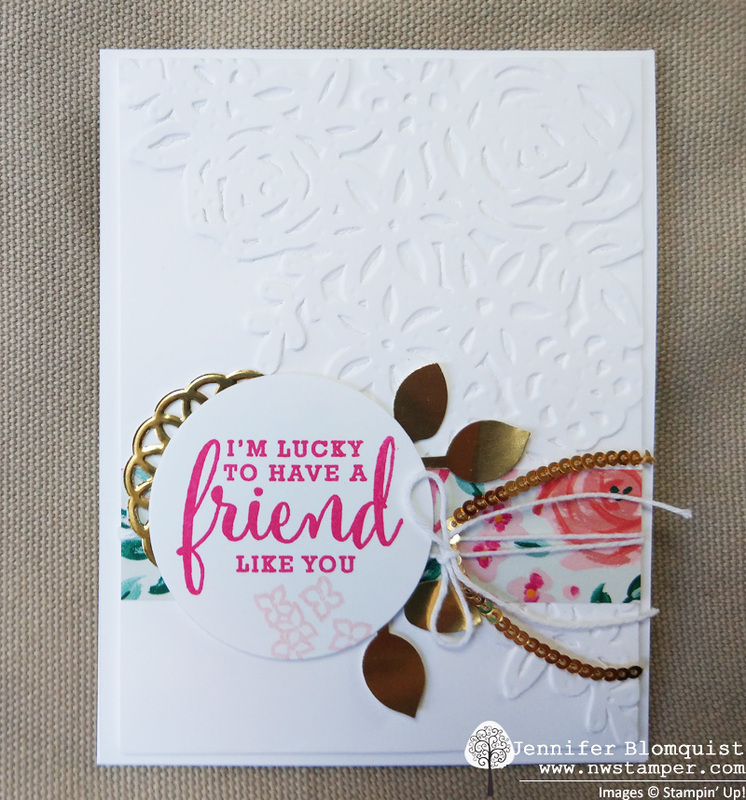 The large, corner die that cuts out flowers and leaves was instead used to emboss the paper, making a pretty raised texture without the need for fussy gluing. To get this effect, you need the Big Shot Embossing Mats. They come with a guide that tells you how to use ANY of your dies for embossing instead of cutting. 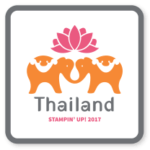 The embossing mats are a mix of silicone and thin plastic sheets that allow you to get just the right shim where your dies can be pressed into your paper to give the raised impression but not pressed so hard that they cut your paper. So awesome, right?! I’ve used the embossing mats before in class, so I promise I’ll post more project ideas with them soon! Its the last day of my 10yr Anniversary Celebration! I was a little behind on getting day 10 out, so you have until 9pm PST TODAY (8/9) to get your comments and orders in before I draw winners tonight! DAY 10 GIFT– Free gift with a $40+ order – YOUR CHOICE! Pick any of the gifts from days 1-9 and you can choose which you would like with your order TODAY ONLY! DAY 10 GIVEAWAY – WIN A SPOOL OF BERRY BURST METALLIC EDGE RIBBON! TO ENTER – Leave a comment on this blog post sharing what type of project you think you’ll be working on next to be entered to win! Winner drawn randomly on 8/9/2018. Don’t forget – you can go back and enter all 9 of the previous days giveaways. You have until 9pm PST tonight to get your comments in. 🙂 Good luck! I need to finish up a birthday card for a teenage boy. Talk about out of my wheelhouse! I will be working on Christmas next. But I definitely want to try embossing with thinlits, like you showed above! I have five birthday cards to make in the next 7 days (who lets things go until the last minute – surely not me). Thank goodness for SU and matching components and stamps with die cuts!